There are two methods on how to install hardwood floors on plywood – nail down and glue down. Each of them has its advantages and hardwood installation techniques. Plywood is a type of subfloor. If you removed the old flooring and found a plywood subfloor, and you think that you can save on leveling, I have to disappoint you. As a general rule, all types of subfloors are not perfect, and it means that you have to work hard to make your next flooring not only look very attractive, but also have a smooth surface. For this purpose, use a straight edge (if the room is small) or a string line (if the room is large enough) to find out the location of the holes and bumps, then mark them using a pencil. Do not rush in making a decision to fill all the holes with the floor self-levelling compound. Sometimes all it takes is to remove only a few extra bumps with a concrete grinder, and your levelling is ready for hardwood floor installation. Before you fill the floor hole with self-levelling compound, first you must put a primer on the wood subfloor, and then fill the hole with a solution, according to the instructions printed on each bag. After that, you do not have to worry that your new cement subfloor will flake off when you are spiking staples or nails into a wooden subfloor. 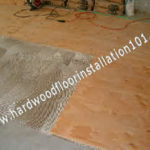 But, you may wonder how to install the hardwood floor on the subfloor, where there are holes deeper than 1 / 4 inch and you cannot pour the cement, because your method of installation is nail down? In order to align the subfloor in this case, you will need a piece of plywood, and sometimes have to use several layers of plywood of various thicknesses. As I mentioned, you can install hardwood flooring on plywood in two ways. The first of them is nail down, and which is described in this article. As a rule, to install flooring in this manner, first you need to spread the material in several rows, using geometric patterns, which will not violate the general rules of the boards’ installation. At the same time, you remove the rejected boards. This is to ensure that during the installation, you do not have to think a lot, trying to keep the procedure and outlook in mind. You will simply move each piece of wood by foot, and nail it to the wooden subfloor with a manual flooring nailer. But, you may ask how to install hardwood floor, pushing the boards by foot, and make the job easy? After all, they will cling to the plywood! To do so, you need to use special underlayment – wax paper. It has three useful features. First, despite its small thickness, it will make the floor soundproof. Second, not allowing the pieces of hardwood to come in contact with a wood subfloor, it prevents the creaking of wood on wood. And thirdly, thanks to its special coating, it allows you to quickly slip flooring boards on its surface, which speeds up the installation process. 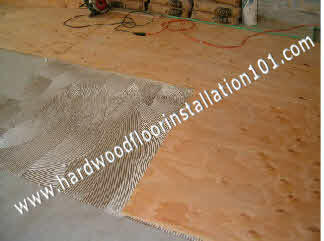 About how to install hardwood floors on cement subfloor, will be discussed in a later article.